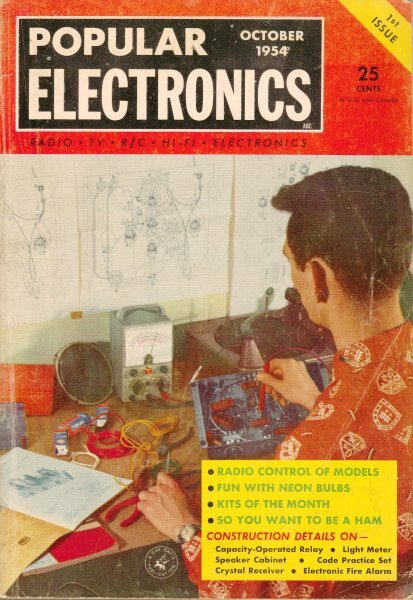 Here is the very first episode of the "Carl & Jerry" series that ran for many years in Popular Electronics magazine. In the manner of The Hardy Boys, Nancy Drew, et al, Carl and Jerry are two teenage boys who, in their pursuit of their electronics hobby, manage to get themselves involved in crime scene investigations, in odd situations with friends and adults, and even while horsing around in their basement laboratory. Every episode is an entertaining combination of mystery, teamwork, drama, and technical discussion. 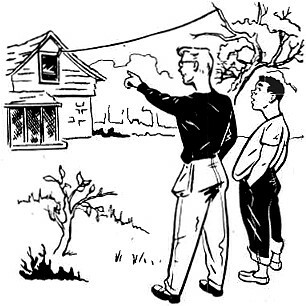 Amateur radio was a key feature of many of their adventures. John T. Frye authored every adventure as he developed his sleuthing buddies over time to go from a frumpy Jerry Bishop with a "well-padded frame" and a Farside-esque bespectacled Carl Anderson to a couple more stealthy, professional looking investigators who sometimes employed MacGyver-like tactics during their antics. See the bottom of this page for a link to a new set of books that contain every installment of Carl & Jerry. Jerry Bishop was in his basement "laboratory," but the teenager was not exactly laboring. Instead, with his well-padded frame stretched out comfortably on a leather couch, his dark crew-cut pillowed on his clasped hands, and his round face staring vacantly up at the ceiling, he was listening blissfully to Patti Page inviting him to "Cross Over The Bridge." The invitation was being issued by a spinning record on a player resting on the floor beside the couch. The throbbing volume that issued from a speaker cabinet in the corner was just barely below the threshold of pain. Suddenly, riding over Patti's dulcet tones, there came a strong youthful voice saying with great deliberation, "One, two, three. four test. This is W9EGV testing. One, two, three, four." Jerry was a firm believer in the conservation of energy; so it was strictly in character that his only immediate reaction to this surprising development was to bat his eyes rapidly like a toad in a hailstorm and continue to listen. Only after the voice continued its rude accompaniment of the singer, now and then alternating the counting and alphabetical-numerical mumbo jumbo with shrill whistles such as one uses in calling a dog, did the boy finally turn over on his side and experimentally lift the needle from the record. As he did this, the singing stopped abruptly; but the strange voice went right on proving it could count - at least as far as four. "It's not on the record," was Jerry's brilliant muttered deduction. He heaved himself to his feet and walked over to the phono-amplifier sitting on a workbench and turned it off. The voice dropped in volume, but it did not disappear. Instead its source switched from the speaker to the open basement window. Determined to get to the bottom of the mystery, Jerry padded up the outside basement steps and stood in the back yard listening. The voice clearly came from an open upstairs window of the house next door, a house into which new neighbors had just moved the day before. As Jerry stared upward, debating his next move, a boy's reddish-tinged curly blond head popped out of the window. He was holding a microphone in his hand and was look­ing upward at a wire that ran from the top of the window frame to a tree back near the alley. "Hey, you, what do you think you're doing?" Jerry demanded. The head in the window turned and stared disinterestedly down at Jerry with. a pair of bright blue eyes behind horn-rimmed glasses. "I don't 'think'; I know what I'm doing," the boy in the window replied coldly. "I'm seeing if my amateur transmitter will load up this new antenna I've put up." "As loud as you were yelling, you wouldn't need a transmitter," Jerry observed tartly. "I wouldn't have to yell if some dope wasn't running his platter-player wide open. Was that you?" "Never mind that," Jerry said hastily. "What I want to know is how come I'm picking up what you say into that microphone on my record player?" "Are you ?" the new boy said with quick interest. "Wait a minute and I'll be over." In a few seconds he burst out the back door and vaulted easily over the low fence between the yards. His tall, lean, well-muscled figure was clothed in a pair of baggy-pocketed army fatigue pants and a torn sweat shirt. "My name's Carl Anderson," he offered. "Guess we're neighbors. What's your handle?" "Handle?" Jerry repeated with a puzzled look. "Sure; I mean your name. That's ham talk." "Oh, I'm Jerry Bishop. Come on down into my lab, and I'll show you the player." As the two boys stepped inside the basement door, Carl stopped and took a searching look around. The first thing that caught his eye was the fine wide workbench that ran clear across one end of the room. On a board above the bench was a miscellaneous collection of hand tools. Carl walked over and disapprovingly ran a finger along the edge of a snaggle-toothed handsaw and inspected a pair of screwdrivers with broken, twisted bits and battered handles. Then he turned his attention to the amplifier sitting on the end of the bench and followed with his eye a long line from the amplifier to the record player sitting on the floor by the couch across the room. Another line went from the amplifier to what looked as though it might be a birdhouse for an ostrich sitting over in a corner of the room. "That's my bass-reflex cabinet," Jerry announced. "I built it myself." Carl walked over to the crude speaker cabinet and examined it closely. "Did you really manage to saw those boards that crooked or have you got a pet beaver that gnaws them off like that?" he inquired disparagingly. "So I can't saw straight!" Jerry admitted with a good natured grin; "but take a listen." As he said this, he turned on the amplifier. The whole basement was flooded with a sea of music. The volume was so great that the whumping of the bass drum actually made the tools jangle on the tool board. Carl strode over and turned the volume down to a mere roar. "It doesn't sound too bad," he grudgingly admitted, "but I'll never know why. I never saw a more haywire layout. That long lead from the player to the amplifier is what is picking up my signal. Wait until I get my solder gun and a capacitor and we'll see if we can cure it." "The trouble is caused by the strong signal from my transmitter collecting on the input element of the first amplifier tube." "You mean on the grid?" Jerry asked. Carl shot a surprised look at him and went on, "That's right. This strong radio frequency signal upsets the normal operating conditions of the tube and makes the amplifier act more like a radio receiver than a plain amplifier. I'm going to connect this small condenser - capacitor is a more accurate name - between the grid of the first tube and the chassis so that signals from my transmitter will be bypassed to ground -"
And then," Jerry smoothly interrupted, "the grid will no longer be swung positive on peaks, grid rectification will stop, and the tube will cease to be biased by grid leak action to the point where it acts as a detector." "Hey, where'd you learn that electronic jive?" Carl demanded. "You got a ham ticket?" "Nope," Jerry answered, vastly pleased at the impression he had made on his new neighbor. "And don't be afraid I'll steal too much of your thunder." He walked over to a bookshelf on the wall that, in contrast to the workbench, was in perfect order. On it were a few books of elementary physics and several stacks of radio magazines. "I get a large charge out of reading anything about electricity or electronics," he explained. "It just happens that the last issue of the magazines in this stack contained an explanation of how radio signals could cause interference to audio amplifiers; so that is why I had that one little item so pat." "Well, all right," Carl remarked as he finished soldering in the capacitor and turned the amplifier on. "We hams get so used to people not understanding what we're talking about that it makes us feel funny when we hear a stranger spouting our lingo. Now let's try this thing. Leave the needle off the record and keep listening at different positions of the gain control. I'll dash over and turn on the rig and put out a test." As he said the last word he was already halfway up the steps. Soon Jerry could hear his voice coming faintly through the basement window; but no setting of the amplifier gain control caused the voice to be heard in the speaker. "The operation is a success, Doctor," he yelled out the window. "Come on back. "Say," he remarked as Carl came back into the basement and perched himself on the workbench, "what was that you were saying about seeing if your transmitter would 'load up' your new antenna?" "That's right. This antenna is cut for 3950 kilocycles, according to my figuring, and I wanted to make sure it would take energy from the transmitter." "What would keep it from it?" "Being the wrong length. A .transmitting antenna has to be the proper length so that it will resonate at the frequency of the transmitter before it will accept power from the transmitter." "How do you calculate the proper length?" "There's a formula for it, but I just use a table in the Radio Amateur's Handbook. It says the proper length is 118 feet and six inches." "Don't you wonder about the reasons behind those tables?" Jerry asked curiously. "Not me. I just want to know how things work, not why. All I know is that an antenna should be roughly a half wavelength long for good transmission or reception of a given frequency." "H-m-m," Jerry reflected, "that reminds me of sound waves. I remember in physics class we found that if an open-ended tube was to be resonant at the frequency of a tuning fork, it had to be a half wavelength long at the fork's frequency. Just for kicks, let's see if radio and sound waves can be handled the same way. First off, if we divide the speed of a wave motion by the frequency of the waves, we get the length of each wave; right?" Carl wrinkled his brow in deep concentration. "I guess so," he finally agreed hesitatingly. "If we knew how many feet a minute a freight train was moving and divided that by the number of identical cars that passed in a minute, we'd get the length of each car. I guess it would be the same with waves." "Exactly. We also know that light and radio waves scamper along at a speed of 300,000,000 meters-per-second, and we have the frequency you are shooting at as being 3950 kilocycles or 3,950,000 cycles-per-second. Check?" "Double check," Carl agreed. "We can lop those three ciphers off each number and divide 300,000 by 3950. You got a pencil and piece of paper?" Without answering Jerry dug down in the litter of papers and books piled on the end of the couch and came up with a cheap and battered slide rule which he began to manipulate with a few extra flourishes strictly for the benefit of his guest. "The answer," he finally announced with all the importance of a Supreme Court Judge handing down a fateful decision, "is very close to seventy-six meters." "We're getting warm!" Carl said excitedly. "This band I'm working is called the Seventy-Five Meter Phone Band." "Since your antenna is going to be a half wavelength long, we chop seventy-six in two and get thirty-eight meters," Jerry continued. "A foot equals 0.3048 meter; so we divide 38 by .3048, and the good old slip-stick says -" he paused to work the slide rule again, "exactly 124.5 feet," he finished weakly. "The good old slip-stick - or the guy slipping it must have slipped," Carl jeered. "That's too far off 118.5 feet to be right - say!" he suddenly broke off as he struck his forehead with a clenched fist, "I remember reading somewhere that a half wavelength resonant conductor is always somewhat shorter than an actual half wavelength in free space. It's shorter by about 5%. Try taking 50% off that and see what you get." "Five percent of 124.5 is close to six feet, and 124.5 feet minus 6 gives us precisely 118.5 feet," Jerry announced triumphantly. "Whew! I'm glad that's over," Carl said as he bent forward and mopped his face with the slack in the front of his sweat shirt. "This brain wrestling is harder. on me than playing in a double overtime game." He and Jerry grinned at each other with the mutual satisfaction that comes from having joined in a successful operation. "Say," Carl began hesitantly, "I've got an idea but if you don't like it, just say so. My feelings won't be hurt. Here's the way I look at it: both of us are interested in electronics. You like to read and think about it; I like to experiment and build things. You've got a dandy place to work but not much equipment. I've got a ham station, a voltohmmeter, and a whole box of radio parts, but no place to work except my bedroom. You're good on math and theory where I am weak, but you do not seem to be too good with tools -"
"Let's face it: I'm about as clever as a cow with a crutch with tools," Jerry admitted without shame. "I like tools and like to work with them," Carl went on. "To cut it short, how's about our sort of joining forces and working together? Maybe I'm wrong, but I think it would be a lot of fun. But if you don't like the idea -"
"I'm with you!" Jerry exclaimed. "A hobby is twice as much fun when you've got someone to work and argue with. As far as I'm concerned, we're in business. What'll we call ourselves? It's got to be something that sounds serious and imposing." "Natch," Carl agreed. "How about 'Electronic Experimenters, Inc.'?" "Let's change that 'Inc.' to 'Ltd.' " Jerry suggested. "Somehow it sounds more swanky." "Fine! I'll get out my mechanical drawing set and make up a sign for over the basement door tonight," Carl said with mounting enthusiasm. For a minute the two stood looking at each other, half serious, half joking. Then Jerry stuck out his hand. "Want to shake on it, Pardner?" Instantly his plump hand was grasped by Carl's sinewy fingers. "Here's to 'Electronic Experimenters, Ltd.' "